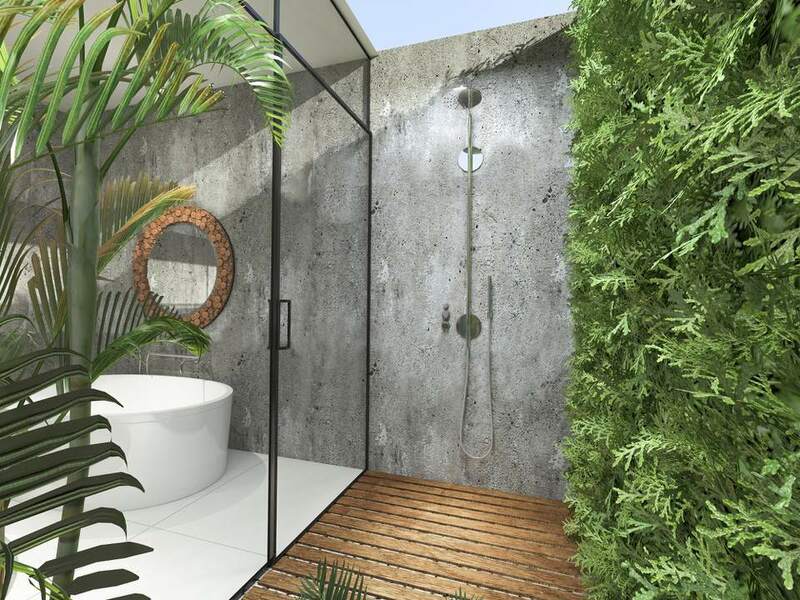 After working in the yard or exercising, what could be more pleasurable than taking a hot outdoor shower? Outdoor showering is a singular luxury that allows a slow transition from the activities of the day to a relaxed evening. Outdoor showers help keep your home cleaner, too, since dirt, sand, grass, and other debris are kept out of indoor shower pans and tubs. Plus, kids who balk at indoor showers are often enticed by the novelty of outdoor showers. A fun and creative project for a warm spring or summer day, building an outdoor shower requires basic plumbing know-how and light construction skills. Since you are not building watertight shower walls (as with indoor showers) the range of possibilities for privacy walls is endless. With this project, you will be building privacy walls from beautiful, low-cost red cedar fence boards. It is likely that your municipality's building code regulates the plumbing-related aspects of the outdoor shower installation. Any new plumbing installation usually requires a permit. Also, shower drainage may be regulated. Some communities may allow your outdoor shower to drain thorough wood deck boards and into a gravel drain bed. In other areas, outdoor showers are not approved to drain into the ground or storm drainage systems and must be connected to the home's waste system. Not only that, a sloped shower pan with built-up lips similar to those found in interior applications must be used, in order for the drainage to properly flow into the waste system. Cold outdoor showers might be acceptable but hot showers are much better. The good thing about building an outdoor shower against the house is that you already have a ready source of hot water that you can tap into in the home. Inside your home is a hot water supply pipe leading from the water heater that feeds various places in the home. Showers, bathtubs, dishwashers, utility sinks, and washing machines all have hot water taps. If you can locate your outdoor shower on the other side of one of these services, you will have both hot and cold water supply lines at your disposal. Find the hot and cold water supply lines within the house that is closest to the area on the other side of the exterior wall where you wish to locate the outdoor shower. If these lines are exposed (as found in basements, crawlspaces, attics, and unfinished rooms), drywall removal is not necessary. If there is drywall, first shut off the water at the nearest intermediary cut-off valve up from the installation point. If there are no intermediary cut-off valves, shut off the home's main cut-off valve. At the electrical service panel, turn off circuit breakers for any electrical supply lines that run through this area. Locate the studs with a stud finder and mark them off. Using a manual jab saw, carefully cut out a section of drywall large enough to expose the pipes and to run additional pipes up to the shower head location, usually about 80 inches high. For example, in the case of horizontal water supply pipes that are 30 inches high, you would cut out a section of drywall that is about 90 inches high by 14-1/4 inches wide (as studs are usually located 16 inches apart on-center). With the water supply still turned off, cut into the hot and cold water supply pipes. Fit a push-fit 1/2-inch by 1/2-inch by 1/2-inch tee into each line. Push the PEX pipe into the open end of each tee and run the PEX pipe up to the shower handle rough-in point. Install the shower handle assembly into the side of the house per manufacturer's instructions. Cut the two PEX pipes to size and attach them to the shower handle assembly. With the remaining PEX pipe, continue one length up to the shower head (faucet) rough-in point. Install the shower faucet and head, then attach the PEX pipe to it. Caulk around the shower faucet from the outside of the house. To create a privacy area that is 4 feet by 4 feet, dig post holes at four points. Each point should be 4 feet from the adjacent point, forming a square. Dig 3 feet down with the post hole digger. Add 6 inches (or about half of a bag) of base landscape gravel to the bottom of each post hole. Set the four-by-fours into place in each hole, checking for plumb (vertical) with the bubble level. Fill each hole with two bags of quick set concrete and fill each hole with water. If your community allows for gray water to run into a drainage bed, dig an area 3 feet by 3 feet by 12 inches deep at the center of the four-by-four posts. Fill the pit with eight bags of the drainage rock. Cut two lengths of 44-1/2-inch boards out of one of the pressure-treated two-by-fours. Cut five of the pressure-treated two-by-fours in half, resulting in ten deck boards each 4 feet long. Set those ten boards perpendicular across the top of the two 44-1/2 inch boards, spacing the latter boards 40 inches parallel from each other. Make sure that the deck boards are spaced about 1/8-inch from each other, then screw them down with the 2-inch construction screws. Place the floor over the gravel drainage area. From the two remaining pressure-treated two-by-fours, cut four boards, each 44-1/2 inches long. With the cordless drill and the 1-inch screws, attach the four joist hangers to the insides of the four four-by-four posts. Two of the joist hangers should be 24 inches high and the next pair should be 56 inches high. Fit the four 44-1/2-inch boards into the joist hangers and secure with the 1-inch construction screws. Face the two sides of the privacy walls with the red cedar fence boards. There should be no need to cut them. Start on the house side, screwing each board across the stringers with two 1-inch screws at the top and two at the bottom per board. Continue the boards toward the front, spacing the boards by 1/8-inch. At the front end, the last board should extend past the four-by-four by about two inches. If you desire, you can rip this last board down so that it is flush with the fence post or leave as-is.